The score and parts currently being used in the performances ofThe Threepenny Operanow playing at Sydney Theatre, are from the 2000 Kurt Weill Foundation edition of the work. The score is in no way an arrangement of mine and I have no idea how this deduction has been made. It is known that there are at least five separate sources for this work including a holograph of Kurt Weill's - that is a score in his own hand and signed by him - together with emendations and additions the work developed. The Hinton/ Harsh edition of the work, the edition we are using, makes this point very clear at the outset. The scholarship is impeccable and the efforts one expects to have been made to authenticate material have been made over and over again. The instrumental forces we are using are, as far as I know and I have researched this thoroughly, are exactly the same instrumental forces used by the Lewis Ruth Band in 1928 and reflected in the current score. In the score there are comments on almost every number dealing with the disposition of the orchestra, that is the way the music had been allocated to the instruments with suggestions for changes, one assumes made by Weill as no other source is noted; for example trombone is sometimes notated as trombone OR violoncello. There are also suggestions for the ways in which the chords written for the guitar, banjo, mandolin and Hawaiian guitar might be realised with some suggestions made as to what might be left out or what might be added. So, in short, every note being heard in this production is as Weill wrote it and not a single note comes from me. I wish I could write as Weill does! 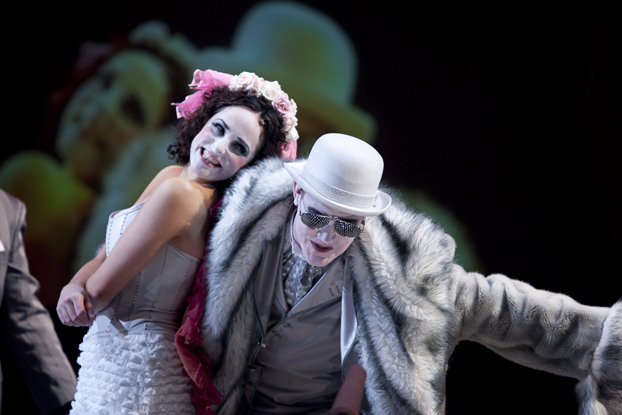 The Threepenny Opera,Sydney Theatre, 1 - 24 September, 2011.